ADIDAS: 7.5 oz. adiZero Rush + TECHFIT Sports Bra Giveaway! I never fully understood the importance of having a good running shoe until I actually began training for my first 5K last year. I realize that footwear is important but I didn’t necessarily understand why one shoe was better than another. I have since learned quite a bit through trial and error. Not the funnest way to learn but I gotta say it’s pretty effective. Adidas has reached out and is offering a giveaway of their brand new adiZero Rush Women’s Running Shoe and these are a pair of shoes that runners can appreciate! They are incredibly lightweight. I was completely blown away by how they felt on my feet! 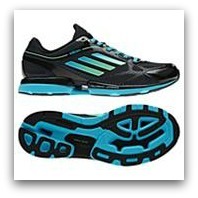 These super light new shoes from the adiZero collection prove less is more and scream fast. Weighing 6.3 ounces, their unique construction and internal SprintWeb enhances breathability and support while nylon mesh keeps the foot locked in for speed and stability. One of the lightest in their class, these shoes provide plenty of resilient cushioning that ensures runners will train hard and race hard by turning up the speed. Breathable tongue: Perforated lining to enhance breathability in the key vascular area of the foot. External/Internal SprintWeb: Ultra thin, high-frequency fused trims deliver seamless, lightweight support. The extremely lightweight, full-length chassis SprintFrame plate provides energy to each stride. Zero mesh: Lightweight, breathable and structurally superior rip-stop nylon mesh keeps your foot locked in speed conditions combined with the lite strike EVA lightweight foam compound that reduces midsole weight by 15% without sacrificing performance. adiPrene+: Resilient cushioning compound in the forefoot to ensure a responsive, dynamic toe-off. adiWear: Extremely durable rubber outsole compound allows for a more minimal usage to ensure lightweight abrasion protection. You can find these shoes and more at ShopAdidas.com. 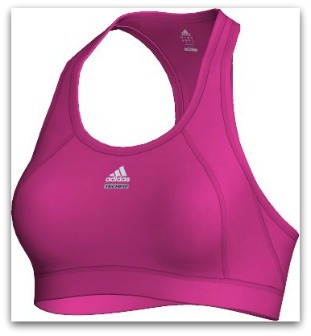 Adidas adiZero + TECHFIT Bra Giveaway! 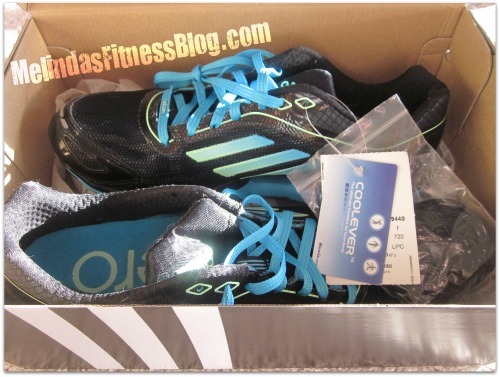 One of my readers will win a new pair of running shoes AND a sports bra from Adidas! Designed to focus your muscles’ energy to generate explosive power, acceleration and long-term endurance, the TECHFIT Bra is the serious athletes’ no. 1 piece of equipment. Including a medium-impact constructed internal bra, the TECHFIT Bra provides a durable and supportive fit that gently compresses and moves with your body. It features a breathable powermesh back with CLIMACOOL technology that keeps you dry by wicking away sweat from your body. Brushed elastic and wrapping seams provide extra comfort and support straps that don’t dig into shoulders. For this giveaway I am using Rafflecopter. Entering is easy but please read the following before doing so to be sure your entries get counted! Winner will be announced on this blog AND on the Mindi Friedland Fitness Facebook page on Friday, March 2, 2012. Please see Terms & Conditions for complete rules. ADIDAS will be shipping brand new items directly to the giveaway winner. Colors of items may vary depending on availability. This giveaway is sponsored by ADIDAS. I was given a complimentary pair of adiZero women’s running shoes. I was not compensated for this feature and all opinions expressed are my own. My favorite cardio is riding my bike. My favorite cardio is Turbo Fire or running. I feel amazing after both. Best feeling in the world! My favorite cardio exercise is HITT and also running. They both give me a boost of energy after I’m done and I love it! TurboFire HIIT Greatest, its fun and you get a great workout in a short time! My favorite cardio is running, outside, not on a treadmill! I prefer an elliptical machine. My favorite cardio is a group class. Although I try to run a good amount, it’s always fun with other people! I love the elliptical because it burns tons of calories! My favorite cardio is running because it makes me feel totally free!! My favorite type of cardio is jump rope, it’s so simple but quite challenging! I like playing soccer for cardio. I am saving up to buy new shoes and all my sports bras are too small on me now. I’d honestly LOVE to win this!!!!! I wish I could jumprope Tiffany! My dogs always get in the way and chase my rope – even after being hit. It is definitely a challenge! Congrats Claire – that is so inspiring! I played soccer growing up and miss it like crazy! My husband said he’d play with me this summer so I’m looking forward to it. Good luck! I like playing soccer for cardio! Everything is more fun when you have a team! I love all things Turbo Jam. I can’t get tired of it, not if I tried. I love the choreography of the moves and the music. I always pump up the music. I love it when she says “I love you!” Lol! She’s awesome. I follow her on Facebook and Twitter because she’s so positive, upbeat and fun. my favorite exercise is running around a local lake with my dog…..
Good one Susan, that sounds so peaceful. I love running since I can physically do it when I couldn’t when I was 80 pounds heavier! I use to have horrible shin splints that kept me from even jogging. Now I’ll run for almost 2 hours! My FAVORITE type of cardio…and you may not think this counts, but this is where My Fitness Pal places it…is YOGA. Obiously, the vigorous flow kind…however, for those who would not agree, my second choice would either on my bicycle or an nice walk/jog outside…or rebounding…or Rockin body…or dancing with friends…. And then I just remembered that I just semi-retired from my other fave cardio, performing (dancing/singing) on stage! My favorite cardio is running for sure. Nothing beats the feeling you get after a good run! I like running the best!! Either outside or treadmill! Both start my day off great! I love zumba, but have a burning desire to run! i love ellipticals and running! I love using the treadmill. The elliptical is my favorite! I am a runner, but I also love Zumba. I love running outside! I get distracted by the scenery I forget that I am exercising. Running is my favorite form of cardiovascular exercise! What a great giveaway! I’m in need of both new shoes and a sports bra! Zumba is my favorite cardio, and boy do you need good shoes for that! My favorite cardio is the elliptical but recently began running. I prefer running outdoors over a treadmill. My favorite cardio excersize is running! My favorite cardio is TurboFire. I feel sooo accomplished after finishing an intense workout.